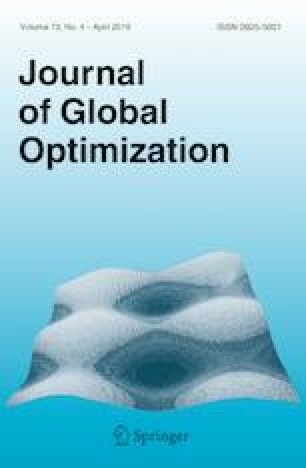 In this paper, we show how a special class of inverse optimal control problems of elliptic partial differential equations can be solved globally. Using the optimal value function of the underlying parametric optimal control problem, we transfer the overall hierarchical optimization problem into a nonconvex single-level one. Unfortunately, standard regularity conditions like Robinson’s CQ are violated at all the feasible points of this surrogate problem. It is, however, shown that locally optimal solutions of the problem solve a Clarke-stationarity-type system. Moreover, we relax the feasible set of the surrogate problem iteratively by approximating the lower level optimal value function from above by piecewise affine functions. This allows us to compute globally optimal solutions of the original inverse optimal control problem. The global convergence of the resulting algorithm is shown theoretically and illustrated by means of a numerical example. This work is supported by the DFG Grant Analysis and Solution Methods for Bilevel Optimal Control Problems (Grant Nos. DE 650/10-1 and WA3636/4-1) within the Priority Program SPP 1962 (Non-smooth and Complementarity-based Distributed Parameter Systems: Simulation and Hierarchical Optimization).